Oral formulation of insulin successful in animal model. Diabetes is a lifelong condition caused by a deficiency in the ability to make insulin, a hormone that regulates glucose levels. According to the Center for Disease Control, diabetes affects roughly 29.1 million people in the U.S. alone, and is one of the major contributors to mortality, leading to over 230,000 deaths annually with its associated comorbidities. Insulin therapy is an important part of diabetes treatment, used to regulate the level of sugar in the bloodstream and storage of glucose. Existing marketed insulin formulations are injectables. Currently, it is not possible for insulin to be taken by mouth, as digestive enzymes in the gastrointestinal tract break down the protein so that it is no longer active. Now, a study from researchers University of California Santa Barbara has shown that an intestinal patch device containing insulin can be swallowed in the form of a capsule and demonstrate efficacy of blood glucose management in diabetic rats. The team state that their mucoadhesive devices fit inside of a small capsule and then deliver the drug in the intestine in a very effective manner. This work was presented at the 2015 American Association of Pharmaceutical Scientists (AAPS) Annual Meeting and Exposition. Previous studies show that insulin is usually administered via injection, which significantly reduces morbidity and mortality; however, approximately 60% of patients fail to achieve long-term glycemic control. This may be due to the use of needles and the complexity of regimen and the late stage at which insulin may be prescribed. To overcome such problems, different routes of insulin administration are currently being tested. The oral route remains the preferred choice for insulin due to its noninvasive nature. However, proteins such as insulin have low oral bioavailability due to their lack of permeability through the intestinal epithelium. Many different drug delivery strategies have been introduced to overcome the low oral bioavailability of insulin. The current study used patches made of mucoadhesive polymers loaded with insulin and an intestinal permeation enhancer, then placed the patch devices in enteric-coated capsules. The lab state that once in the intestine, the patch-containing pills are specially designed to dissolve, releasing the patches so that they can attach to the intestinal wall for site-specific delivery of the insulin. The mucoadhesive strength of the patches was determined by placing patches on porcine intestine. Results showed that after 30 minutes, the patches were gradually pulled away from the intestine and the strength required to completely detach the patches from the intestine was quantified using a microbalance. To further assess the efficacy of the patches, diabetic rats were fasted overnight and orally fed the capsules in the current study. The group state that blood glucose levels were thereafter determined at different time points for up to eight hours using a commercial blood glucose meter to calculate the percent drop in glucose levels. Data findings show that the patches showed a complete drug release profile, releasing 100 percent of the insulin and permeation enhancer content within five hours of study and demonstrated an excellent mucoadhesive strength. Results from in vivo efficacy studies revealed that insulin patches containing 10 percent permeation enhancer were the most effective formulation, where the blood glucose levels dropped significantly in comparison to the control group, which showed no decrease in blood glucose levels over the same time period. The team surmise that their findings suggest that this unique drug delivery approach could be used to deliver insulin orally in a continuous, time-dependent manner. For the future, the researchers will continue in vivo rat studies to evaluate the intestinal patches for faster or extended release of insulin; and will also assess the oral delivery of other peptide drugs for diabetes (exenatide) and even osteoporosis (calcitonin). Pathways for insulin nanoparticle translocation through the intestinal epithelium. 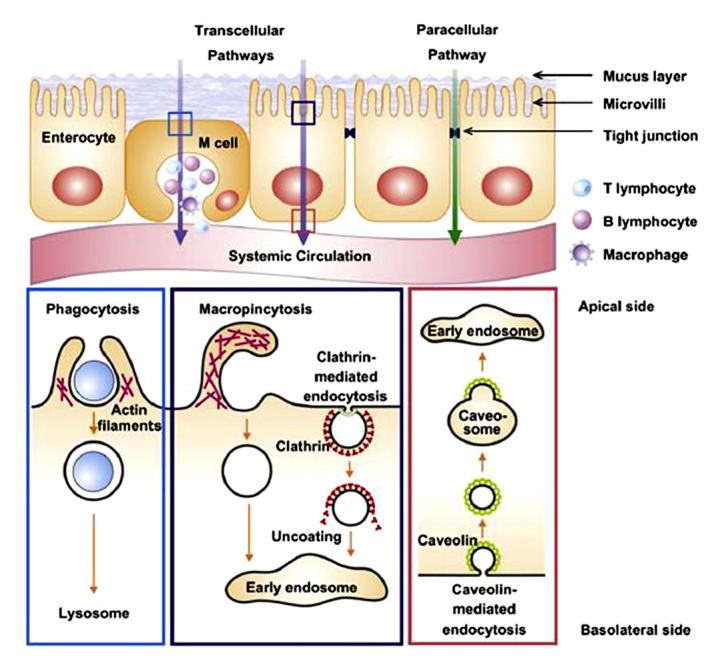 Schematic focus on phagocytosis, macro-pinocytosis, and caveolin-mediated endocytosis. Reproduced with permission from Biomaterials. Oral Insulin Delivery: How Far Are We?. Sarmento et al 2013.